UPSC Geologist Admit Card 2019: UPSC Combined Geologist and GeoScientist Examination 2019 is scheduled to be held on 28-06-2019. It is expected that UPSC Geologist Admit Card will be available online in the Second Week of June 2019. Contenders can download the UPSC Geo-Scientist Admit Card from this page. We will update this page with direct link when UPSC Combined Geologist and GeoScientist Examination Admit Card will be issued officially. UPSC Notification and UPSC Geologist Exam Date 2019!!! Union Public Service Commission will release UPSC Geologist Recruitment Notification on 20-03-2019. So, interested candidates can apply for Combined Geologist and GeoScientist Examination 2019 till 16-04-2019. UPSC Geologist Exam will be conducted on 28-06-2019. If, any candidates found wrong detail in UPSC Geologist Hall Ticket, then he/she must inform to commission. For more details regarding UPSC Geologist Call Letter, you need to go through this page which is well prepared by team of www.privatejobshub.in. Have a look for UPSC Combined Geologist and GeoScientist Admit Card 2019!!! It is mandatory for the candidates to carry UPSC geoscientist admit card with them at the time of examination. It may be noted that the candidates without UPSC geologist exam 2019 hall ticket will not permit to appear in the examination at any cost. Candidates need to visit official site of Union Public Service Commission for hall ticket that is www.upsc.gov.in. On home page of official site go to “Examination” section and hit the link. After that hit on “e-Admit Card” link under “Examination” section. Select link related to e-Admit Card – Combined Geo-Scientist and Geologist Examination, 2019. Follow “To Download e-Admit Card” column and select “Hit Here” link. Read the instructions carefully and hit “Yes” link. Candidates may also get their hall ticket either by Registration Id or By Roll No option. After pressing the registration id option you will get a page which like this image and now need to fill Registration ID which should be 11 Digit and choose date of Birth which you fill in the application (DD/MM/YYYY) & fill Captcha Code in provided box. At last, press “Submit” button for the final submission of it. 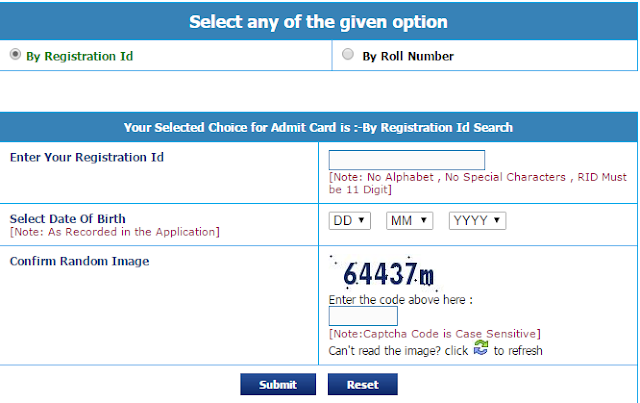 After submitting, you will be able to see your admit card on your displayed. Save UPSC Geologist Admit Card on your desktop and take a print out of it for the purpose of examination. 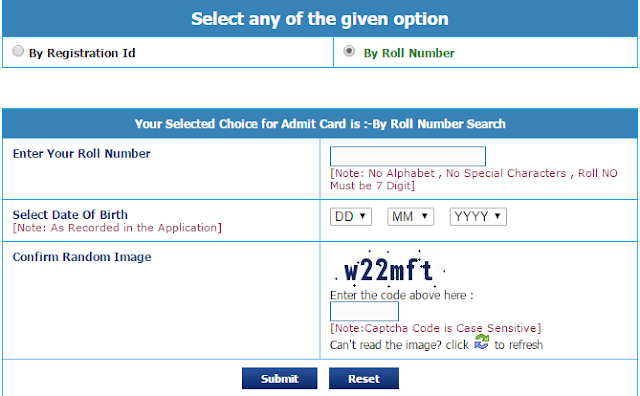 Candidates, if you are selected “By Roll No.” option, now, you have to fill your “Roll Number” which should be 7 Digit and Select date of Birth (As Recorded in the Application) & enter Captcha Code in given box. Now card letter will be shown on your computer screen. Take print out of UPSC Geologist Exam Admit Card and bring it with you at the time of Exam. What to bring for Exam? Candidates are advised to download UPSC Geologists Admit Card through direct link provided below and must bring it with ID proof (Passport, Adhar Card, PAN Card, Driving Licence, Voter Card) and passport size photo at the exam day to avoid any difficulty. Which items will not bring at the time of examination? Mobile phones or any other communication devices are not allowed in the examination. Candidates bringing Mobile phone or any other communication devices or any banned item with them will not be allowed entry into the premises of the Examination Venues. Any infringement of these instructions shall entail disciplinary action including ban for future examination. In case of any difficulty faced by the candidates in downloading UPSC e-Admit Card, they may contact the UPSC Facilitation Counter on below stated no. on any working day between 10.00 AM to 5.00 PM. No Admit Card will be sent by post. Contenders remain stay connected with us and subscribe our free email part at www.privatejobshub.in to obtain all latest notifications regarding job / education/ college details etc directly in your mailbox. You can join us on Facebook and Google Plus. We will send all latest details of UPSC Geologist June Exam Hall Ticket on your Face book wall. Candidates may download their UPSC Geologists Admit Card 2019 through this direct Official Link.